The race to learn more about space has meant the creation of satellites, huge amounts of data about the earth, and new methods of creating maps. A total of £50k of funding for the SpaceTech Incubation Initiative will support start-ups and innovative small and newly-formed companies in the South West to use space technology in their work. 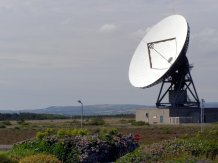 The new scheme will be run by the South West Centre of Excellence in Satellite Applications, an initiative to promote economic growth led by the University of Exeter co-funded by the Satellite Catapult and UK Space Agency in partnership with Met Office, Plymouth University, Falmouth University, Plymouth Marine Laboratory, Rothamsted Research, Goonhilly Earth Station Ltd, and Peninsula Innovation Ltd. The project is one of three across the UK to be given funding by the UK Space Agency. It will support the Government’s Industrial Strategy, which emphasises the importance of science, innovation and skills. Up to 20 companies and entrepreneurs will have access to advice and support, facilities and resources. The space sector is a UK success story, with growth averaging over 8 per cent a year over the last decade, a turnover in excess of £11 billion a year and ambitious plans to achieve 10 per cent of the global space market by 2030. Much of this growth is anticipated to come from companies using space-derived data or services in a broad range of different sectors.